The internet is a big source of knowledge. If you do an exploration, it is unpredictable. A thing took place when a Twitter user shared a photo of a mundane number 8 diamond card. Plinkety Plink, who is the Twitter user shared the photo from some cards. There are more than one lakh likes and thirty-six thousand retweets. The tweet is going viral and has generated a big buzz online. Can’t find it? Well, a few helpful users did draw it out for others. Take a look here. 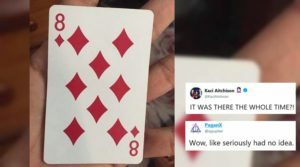 What started out to be a random tweet, stunned people all around the globe and most said it was not until this tweet they had realised that the number was hidden on the piece of card. While most said they can’t “unsee it” other remarked it was a life-changing revelation. Cripes! I just saw it right now. And in 3 months and 2 days I’ll be 67. Did you know there was a hidden eight on the card?